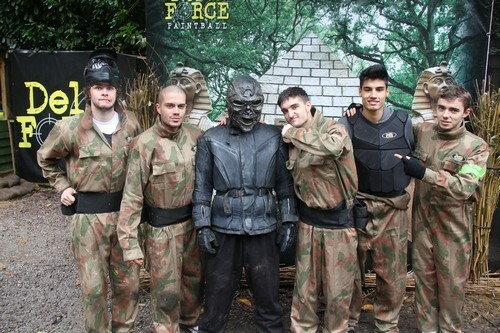 The Wanted play paintball at Delta Force! 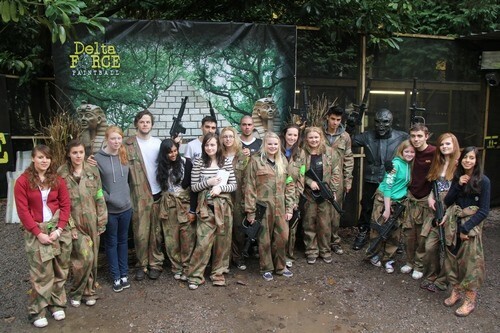 On Saturday 10th November, Delta Force Paintball in Maidenhead played host to the popular boy band The Wanted. All team members – Max, Siva, Nathan, Jay and Tom – enjoyed an afternoon of paintball along with a selection of lucky fans who had won a competition to play alongside the band members at our paintball centre. Many photos and pictures were taken of The Wanted trying out our equipment and posing for pictures with their fellow comrades. The group of 20 players were kitted out in our latest paintball equipment including camouflage overalls, body armour and played with M16 semi automatic paintball guns. They played our finest selection of paintball game zones in the UK including the Black Pearl which incorporates a large Galleon set against a stunning woodland backdrop, and our Siege of Stalingrad zone which features a border crossing lined with shops and downed soviet-era military trucks from the 007 Bond film Tomorrow Never Dies. The Wanted also encountered the Delta Force terminator whilst on site, and after exchanging friendly fire they vowed to return again for another battle. The team at Delta Force would like to thank The Wanted for choosing our Maidenhead paintball centre for their fun day out and we wish them all the best in their future endeavours!